Topic: POTM April 2012 - vote now! Re: POTM April 2012 - vote now! Nice start. If you have any anemones or zoas hidden on the rock they will move themselves to a spot they like. The only thing you will probably find that would need more or less current are sponges. Have you thought about the kind of light fixture you'll get? Topic: Couple of vids of my Valentini (Canthigaster valentini)..
Re: Couple of vids of my Valentini (Canthigaster valentini)..
Great puffer. Valentini's are my favorite. CUC is the abbreviation for Clean Up Crew. CUC's are generally a mix of invertebrates; the most common being composed of true crabs, shrimp, snails, and hermit crabs. Certain species of sea slug can also be part of a good CUC. I clean every side but the back. Though, a good CUC can usually take care of everything on the glass. Topic: Ares new tank! Pics! Re: Ares new tank! Pics! Great tank! I'm sure he's happy. Check out this thread on NR - http://www.nano-reef.com/forums/index.p ... pic=231358. 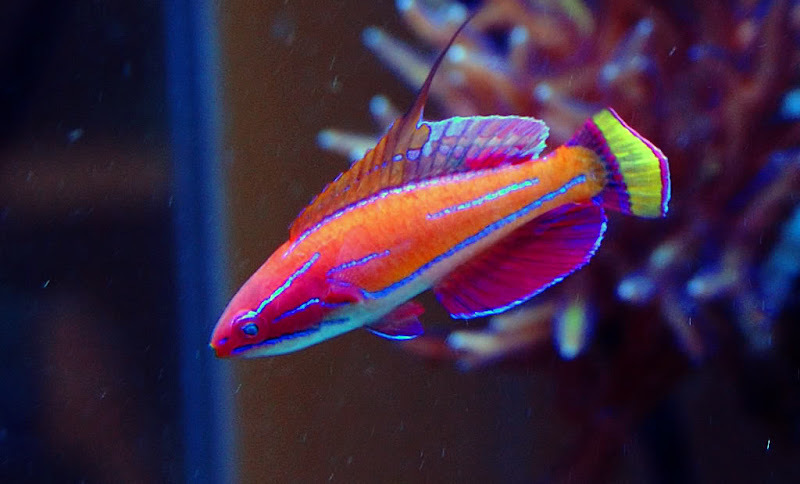 There are some great pictures there, including the below flasher wrasse. Topic: Cant decide what Angel fish to Get! Re: Cant decide what Angel fish to Get! A vibrantly colored coral beauty is stunning, and I find them more appealing than a flame. Have you thought about a lemon peel? Also a good angelfish. muffinman3560 wrote: Please don't double post. Calm down. I would read the link she posted. RC is a very knowledgeable site when it comes to the reef/sw side of the hobby. Topic: did walmart finally stop selling gsps?? Re: did walmart finally stop selling gsps?? Pufferpunk wrote: None at mine. I haven't seen any around here either. Thankfully. That's a big shell in there. I can only imagine the size of the snail. Good luck with your corals. How long has it taken the new one to get to 8"?